He was a perfectly nice guy and a consummate professional. But he was also a middle-aged white man with a Southern accent who seemed unperturbed by this weeks news. 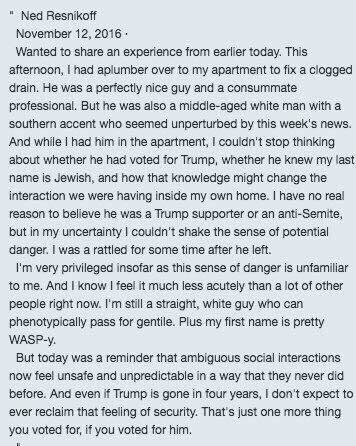 … I couldn’t stop thinking about whether he had voted for Trump, whether he knew my last name is Jewish … I couldn’t shake the sense of potential danger. I was rattled for some time after he left. The best way to be sure that 2017 is not 1934 is to act as though it were. Of course, you don’t need these examples if you have Democratic Facebook friends. Just read their posts — alarms about journalists jailed and killed, brownshirts, ethnic cleansing, pervasive surveillance, people living in fear, exterminationist violence, the whole nein yards. They’re scared. The thing is, they’re not poseurs — they’re sensible citizens. They are, many of them, my friends. They’re in no way ignorant. That’s why the dismissive label “Trump Derangement Syndrome” doesn’t seem an accurate description (in addition to being belittling and ineffective). If they see the seeds of authoritarianism in Trump’s “Hamilton” tweet — or more plausibly in his suggestion that he might pick and choose which reporters can attend briefings … well, sure. Those are seeds. There’ve been seeds before, of course. There were the seeds of authoritarianism in Truman bullying a press critic who panned his daughter’s singing. There were more than seeds in Roosevelt’s NRA, in Nixon’s wiretapping and J. Edgar Hoover’s longrunning COINTELPRO surveillance and harrassment of dissenters. It’s not deranged to extrapolate from seed to tree, and to worry that the relative handful of alt-righters (50,000 ?) and smaller handful of anti-Semitic trolls (1,600?) might produce something very bad. You can imagine a world where Jews are attacked by their plumbers. My mother grew up in such a world (Frankfurt, Germany in 1933) and I’m here because her parents had the good sense to flee. It’s thinking that such development–from seed to tree–is at all likely today that seems … well, wrong. Let’s call it wrong! We have strong counter-majoritarian institutions (including an independent judiciary) and a culture that supports them. The idea that Trump is going to mobilize some army of thuggish supporters to intimidate the press, the courts, the opposition party and half of his own party seems a fever dream, no less feverish because of its rational basis. Yet those who adhere to this unnamed tendency — let’s call it ’34ism, unless you can come up with a better name *** –allow the power of their terrifying dream to overwhelm sober consideration of everything Trump does or intends to do, good or bad. We’re supposed to draw up sides — condemning (and ostracizing) those who are “complicit” in Trump’s administration and welcoming those who “stand on the right side of history” — even before we know whether the authoritarian seed will grow or wither, disregarding all the other positively auspicious seeds (reform of trade, control of borders, fewer foreign military adventures, ending the Republican threat to Social Security and Medicare, etc.) that might flourish instead. In Slate 34ist Yascha Mounk’s head it’s practically Life During Wartime already, with brave Trump critics fired from their jobs, sleeping on the couches of their secret colleagues in the Resistance. Keep the car running. Suggested alternative: See what happens first! Don’t let the reaction to Trump be dominated by one extremely unlikely bad possibility, at the expense of nurturing the far-more-likely good possibilities. **– The Hooey: Gopnik says authoritarian measures against critics “are unprecedented and, history tells us, likely to be almost impossible to reverse.” This is fatuous on both counts. 1) Even direct assaults on free speech are far from unprecedented –e.g. the Sedition Act of 1798, passed not too long after our nation’s founding, or the imprisonment of Eugene Debs for opposing World War I. 2) They also haven’t been that hard to reverse. The Sedition Act was repealed in Thomas Jefferson’s term expired in 1801 after Jefferson campaigned against it and the House voted down an attempted renewal. It’s highly doubtful that Debs could be imprisoned under current First Amendment law — the opposite of what Gopnik declares “history tells us”. *** — Better name ideas appreciated — just put them in the comments section below, or tweet them to @kausmickey. Thanks.